Small Welsh housebuilders are being squeezed out by the increased cost of planning consent, according to the body that represents them. The Federation of Master Builders Wales (FMB) said the planning process was "too complex" and "too expensive". It will give evidence to the assembly's economy committee, which is looking into barriers facing smaller housebuilders. One builder said problems were contributing to the housing shortage. Huw Francis, chief executive of Swansea-based Hygrove Homes, argued that the issues facing small housebuilders meant fewer houses were built each year. In evidence sent to the committee, he said gaining planning consent was becoming more expensive partly because of the requirement for architectural, ecological and hydrology reports. He also said Natural Resources Wales (NRW) was slow to respond and duplicated some of the work of local planning authorities. Meanwhile, the FMB said since the 2008 financial crisis, traditional banks had stopped lending to small construction firms. The Federation of Small Businesses Wales (FSB) said recent evidence suggested "the housing market has become dominated by a small number of very large firms". 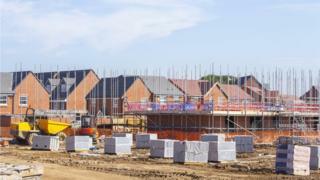 It said estimates suggest around three quarters of new houses were being built by five large firms. The FSB said last year around 6,000 houses were built across Wales - broadly speaking the Welsh Government estimates around 8,300 need to be constructed every year. UK Finance, which represents the banking industry, told the BBC it disputed the accusation that banks were not lending to smaller housebuilders and said it was determined to help them construct more homes and there were more finance options available. NRW said it worked closely with partners to make sure that developments take place in the most appropriate locations, and that in 2017-2018, 97% of around 7,000 planning applications received a response within "statutory or other agreed deadlines".